In many industrialized countries the number of meals prepared and consumed outside of the home has steadily increased and is now estimated to exceed the number of meals prepared in. In many industrialized countries the number of meals prepared and consumed outside of the home has steadily increased and is now estimated to exceed the number of meals prepared in. 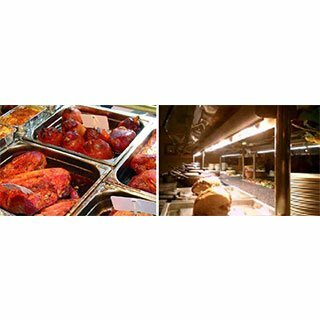 The prepared hot food might also be placed in a buffet type covered serving area with infrared lamps spaced above to keep the food warm while the serving line is available. TOSHIBA Jacketed infrared lamps are housed by clear quartz sleeve. – For anti-scattering protection against quartz piece by accidental break of heater inside. – To avoid chemical attacks over heater tubes to maintain good performance. – To protect the infrared lamps from unexpected thermal shock such as splashed water or foods. TOSHIBA new MAGIC-FIT is the best connector to fix infrared halogen lamps for catering application. This connector is wireless and fast, simple and smart to fix infrared lamps when assembled and replaced. Therefore this new concept brings you a lot of benefits and advantages to save time and money.